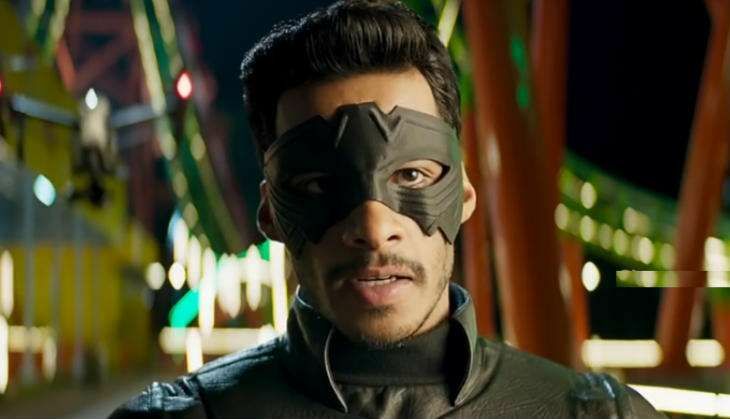 The trailer of Baahubali writer KV Vijayendra Prasad's upcoming film, Jaguar, is out. The Telugu-Kannada bilingual marks the directorial debut of Mahadev and the acting debut of Nikhil Gowda, the grandson of former Indian Prime Minister HD Deve Gowda. The film has been produced by Nikhil's parents, HD Kumaraswamy and Anitha Kumaraswamy. The Bajrangi Bhaijaan writer's new film also marks the Telugu-Kannada debut of Deepti Sati, of Malayalam film Neena fame. The one-minute-thirty-nine-second Kannada trailer introduces the lead characters of the film. Nikhil Gowda will be seen essaying dual roles, as Kicha, an MBBS student and as a super hero. Interestingly, his super hero look is largely copied from Salman Khan's devil look from the 2014 Bollywood blockbuster, Kick. Deepti Sati will be seen enacting Nikhil's love interest in the film. The trailer also showcases hot chemistry between Nikhil and Deepti, thanks to a sizzling lip-lock, which is sure to grab many eyeballs. The trailer also features veteran actor Jagapati Babu as cop while Baahubali actress, Ramya Krishnan is blink-and-miss in the trailer. From the trailer, Jaguar promises to be an out-and-out action entertainer with all commercial elements. Jaguar also stars Brahmanandam, Sadhu Kokila, Sampath Raj and Kavita Radheshyam. The Telugu version of Jaguar is slated to-be-revealed on 18 September in Hyderabad.